Formerly RN Boys Training Establishment, relocated to Isle of Man at start of war, site transferred to control of HMS DAEDALUS. Basic new entry and pre-flight training of RNVR Air branch officer cadet ratings. Overflow accommodation for FAA Barracks, Lee-on-Solent. The establishment is located on Forton Road, Gosport. Forton Barracks was the home of the Portsmouth Division Royal Marine Light Infantry from 29th March 1848 until 1st August 1923. 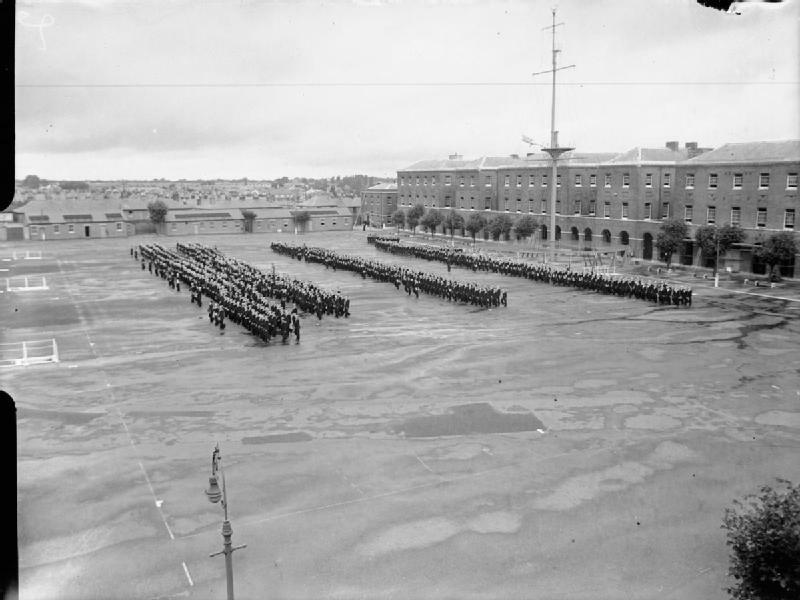 The Barracks was converted to an RN new entry boys training establishment in 1924 and was commissioned as HMS St. Vincent, a Naval training establishment, 1st June 1927. When World War Two started the Boys training task relocated to The Isle of Man and the site was taken over by the Fleet Air Arm to provide new entry and pre-flight training of RNVR Air branch officer cadet ratings. The site also served as an overflow for the Fleet Air Arm Barracks at RNAS Lee-on-Solent and an RN Signals School. On 22nd July 1940 a FAA torpedo training section opened. RNVR Air Branch officer candidates could be selected from the lower deck as ratings recommended for Pilot or Observer training through the CW scheme; the upper age limit was 39 years old at the time of recommendation. Others were direct entrants, civilians trained from scratch. 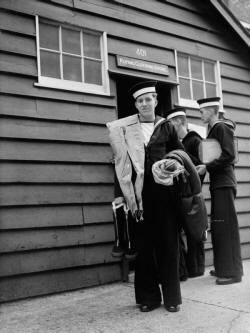 IN the early years of the war ratings reported to HMS DAEDALUS, RN Barracks at Lee-on Solent to receive basic kit and training before moving to HMS ST. VINCENT for classroom instruction and further training. 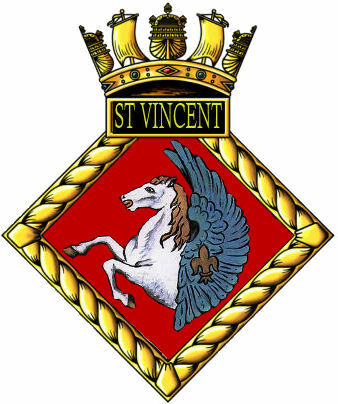 After a few years this changed and all officer candidates reported directly to HMS ST. VINCENT. All direct entrant officer cadets were rated as naval airmen 2nd class and issued with ratings basic kit and 'square rig' uniform of bell-bottoms and 'milk churn' hat. A white band encircled the cap, in place of a cap tally, to denote ratings were officer cadets. Stage one of training at HMS ST. VINCENT was basic new entry training which took seven weeks. On successful completion of stage one candidates were promoted to Leading Naval Airman and issued with their flying clothing in preparation for stage Two; Elementary Flying Training (EFT) for Pilots and the Observers course for Observers. EFT involved two months of basic flight training and was done at many different RAF airfields around he UK, but a majority passed through Luton and Elmdon, when the number of trainees increased some were sent to America to learn the basics at US naval Air Station Pensacola in Florida. On completion of their Elementary Flying Training officer cadets received their wings and were rated Pilot Ratings. 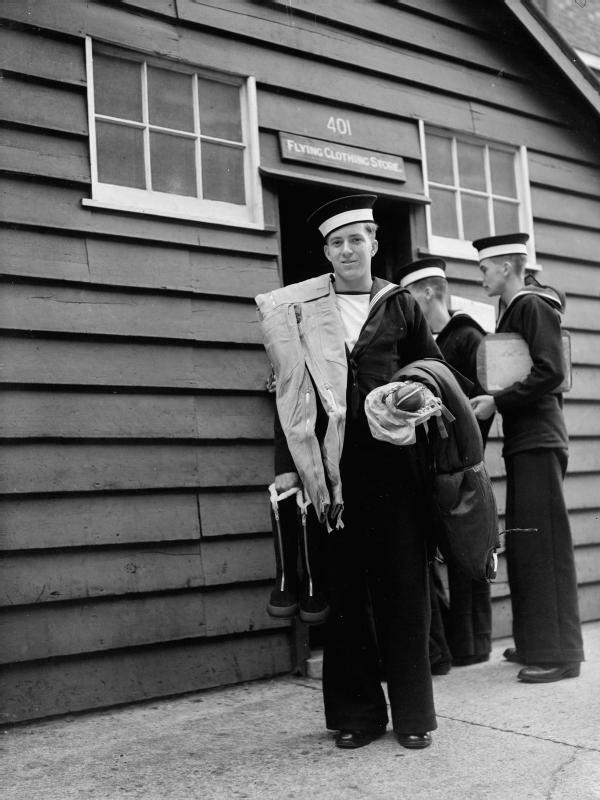 Those who failed were interviewed at HMS DAEDALUS and some allowed to start over as Observer trainees, others were returned to their units or joined mainstream new entry establishments. Stage three was conducted overseas at Service Flying Training Schools, many attended 31 SFTS at RCAF station Kingston. Ontario, for the three month course while those trained in the US moved to other US Navy schools. On return to the UK the successful trainees were interviewed by an Admiralty Board to decide if they were to be commissioned. Those under 19Â½ would become a Temporary Acting Midshipman RNVR, over 19Â½ a Temporary Acting Sub Lieutenant RNVR. Now commissioned the new pilots were sent to RN College Greenwich for a two-week 'spoon and fork' course to learn the etiquette of the wardroom and how to conduct themselves as officers. successful trainees qualified as Pilots, but not recommended or who did not wish for a commission, were rated as Acting Petty Officer Pilot RNVR. Observers followed a different trading path. unlike RNVR pilots they was no direct recruitment at he start of the war, this only began when demand for aircrew required a change in recruitment policy. Candidates solely for Observer duties had to have achieved the School Certificate standard in education and suitable for commissions; there were no rating Observers. Their time at HMS ST. VINCENT was similar to that for pilot trainees but more emphasis was given to navigation skills. 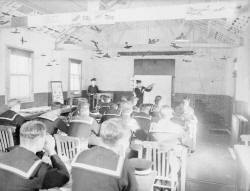 Training was in four stages, Stage two after promotion to leading naval airman, was first a stint at HMS EXCELLENT, Whale Island, Portsmouth, for gunnery instruction, before moving on to stage three, wireless and visual signalling courses at a Naval Air Signals School at either HMS RAVEN, RNAS Eastleigh or HMS CONDOR, RNAS Arbroath. The largest and last stage of training was flight training at Air Observer school. From December 1940 trainees could be sent to either No.1 Air Observers School at HMS GOSHAWK, RNAS Piarco, Trinidad or to No.2 Air Observers School at HMS CONDOR, RNAS Arbroath; prior to this date this was done at HMS DAEDALUS, RNAS Lee-on-Solent or HMS PEREGRINE, RNAS Ford but the schools were relocated when enemy air raids threatened the airfields on Britain's South coast. 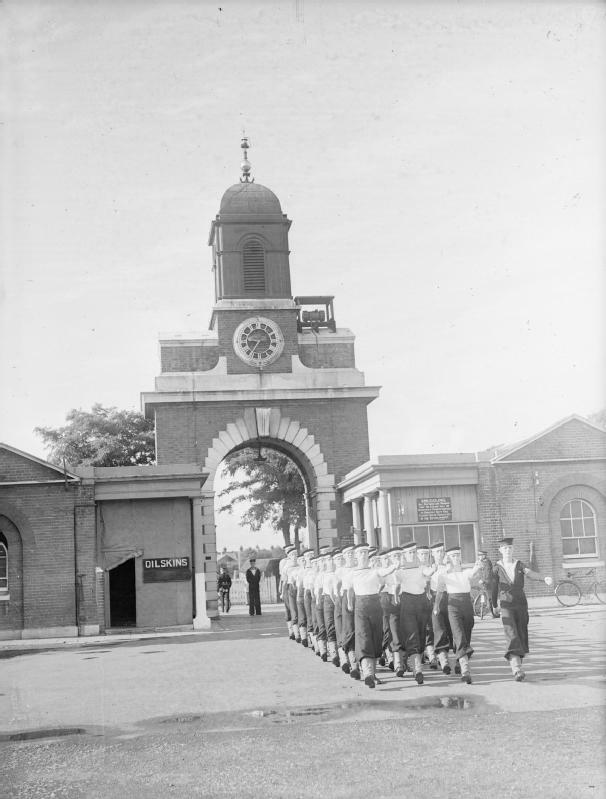 Observers received their wings on completing the Observer school but were not commissioned until at the end of their fortnight at RN College Greenwich; from there they were appointed to operational conversion squadrons to prepare them for front-line service..
Telegraphist Air Gunners. The third type of Air Branch ratings to pass through ST. VINCENT was the Telegraphist Air Gunner (TAG). Ratings were recruited both from direct entry or transfer from an existing branch of the RN. Direct entrants reported to HMS ROYAL ARTHUR, Skegness, for their 7 week new entry and basic training before being drafted to HMS ST. VINCENT as Naval Airmen 2nd Class; men accepted for transfer to TAG were drafted to HMS DAEDALUS to await the available next course. On completion of the 4 week part one TAG training the TAG candidates received their flying kit and were allocated to a TAG School for their part two training; for many this was No. 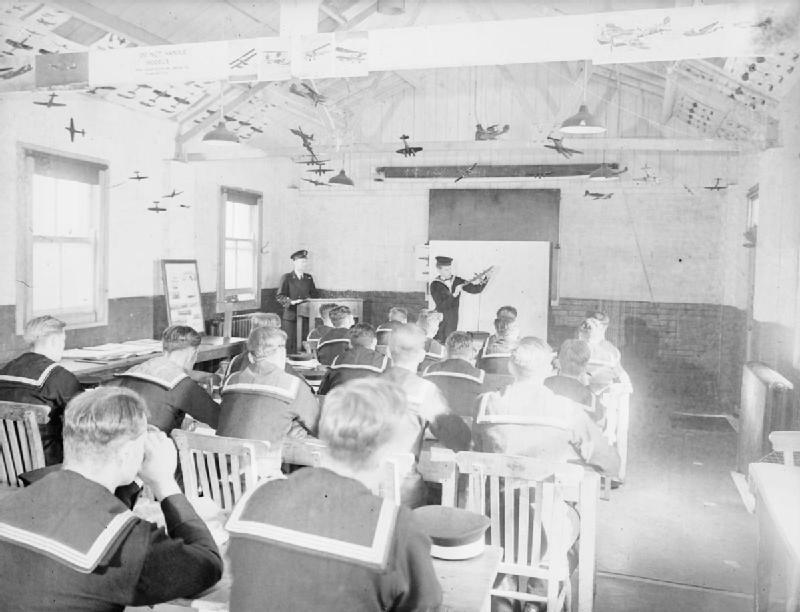 1 Air Gunners School at RCAF Station, Yarmouth, Nova Scotia. HMS ST. VINCENT reverted back to a Boys Training Establishment on 1st December 1945 and remained in service until it closed in December 1968. 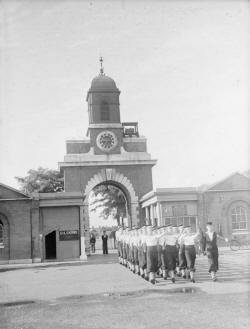 Officer cadets of the RNVR Air Branch marching through the picturesque gateway of HMS St VINCENT Â© IWM (A 18360). Divisions in progress at HMS ST VINCENT, potential pilots and observers of the Fleet Air Arm spend their first few weeks here. Note the masthead at one side of the parade ground Â© IWM (A 18354). Officer cadets undertake an aircraft recognition class at HMS St VINCENT Â© IWM (A 18356). Officer cadets of the RNVR Air Branch collecting their flying kit issued from the stores at HMS St VINCENT Â© IWM (A 18368).